Today is Easter. The day that Jesus rose from the grave and defeated the power of death for all who believe in Him as their Savior. Read what the Scripture has to say about the resurrection. 1 Now after the Sabbath, toward the dawn of the first day of the week, Mary Magdalene and the other Mary went to see the tomb. 2 And behold, there was a great earthquake, for an angel of the Lord descended from heaven and came and rolled back the stone and sat on it. 3 His appearance was like lightning, and his clothing white as snow. 4 And for fear of him the guards trembled and became like dead men. 5 But the angel said to the women, “Do not be afraid, for I know that you seek Jesus who was crucified. 6 He is not here, for he has risen, as he said. Come, see the place where he lay. 7 Then go quickly and tell his disciples that he has risen from the dead, and behold, he is going before you to Galilee; there you will see him. See, I have told you.” 8 So they departed quickly from the tomb with fear and great joy, and ran to tell his disciples. 9 And behold, Jesus met them and said, “Greetings!” And they came up and took hold of his feet and worshiped him. Christ died for our sins in accordance with the Scriptures, 4 that he was buried, that he was raised on the third day in accordance with the Scriptures. 14 And if Christ has not been raised, then our preaching is in vain and your faith is in vain. 15 We are even found to be misrepresenting God, because we testified about God that he raised Christ, whom he did not raise if it is true that the dead are not raised. 17 And if Christ has not been raised, your faith is futile and you are still in your sins. 20 But in fact Christ has been raised from the dead, the firstfruits of those who have fallen asleep. 21 For as by a man came death, by a man has come also the resurrection of the dead. 22 For as in Adam all die, so also in Christ shall all be made alive. 54 When the perishable puts on the imperishable, and the mortal puts on immortality, then shall come to pass the saying that is written: “Death is swallowed up in victory.” 55 “O death, where is your victory? O death, where is your sting?” 56 The sting of death is sin, and the power of sin is the law. 57But thanks be to God, who gives us the victory through our Lord Jesus Christ. 58 Therefore, my beloved brothers, be steadfast, immovable, always abounding in the work of the Lord, knowing that in the Lord your labor is not in vain. Our response to the resurrection should be to worship the risen Savior. A way to worship Christ is to tell others about the death, burial, and resurrection of Jesus and what that accomplishes, namely, a restored relationship with God that will last for all eternity. (1) Because Christ was raised from the dead we can be assured that our relationship with God has been mended. God resurrecting Christ from the dead proves that Jesus’ sacrifice on the cross was sufficient to satisfy His wrath and mend our relationship with God. (2) We can face death with joy being assured of eternal life. Jesus was not resurrected in order to die again like Lazarus or Jarius’ daughter; rather, He was resurrected and given a new body, in order that He might live and reign forever. Because Christ defeated death in the resurrection, we too, if we believe in Jesus as our Savior, will defeat death, be resurrected and given a new body. One that will not grow old, experience pain, disease, or even death. As a result of the resurrection, we can look death in the face knowing that we, those who are in Christ, will experience eternal life. Pingback: In Reality…A Birthday Gift! by Gene McGuire April , 2011 « WISDOM OF GOD! Hi. 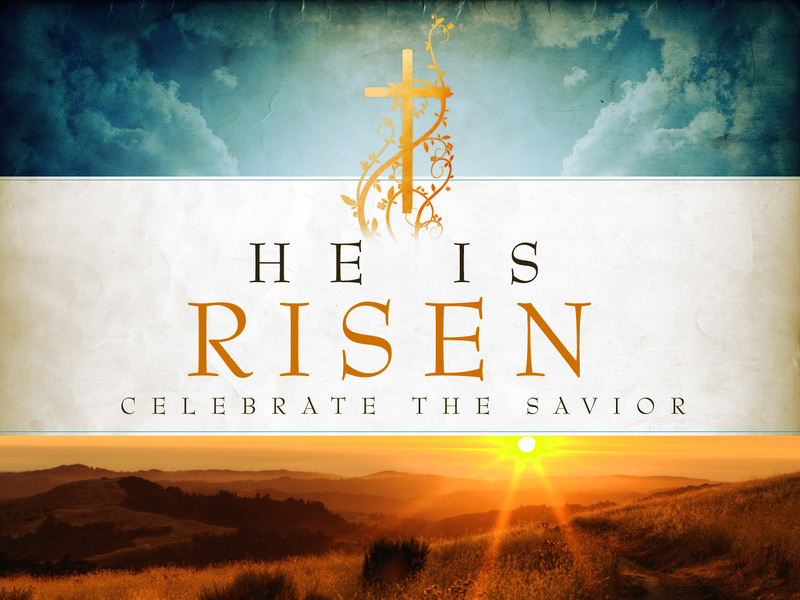 Can i Share Celebrate the Savior for He is Risen to my Facebook page? Go for it. Feel free to share any of my posts on social media. Happy Easter! I would like to ask permission to post your He is risen picture on my facebook. Thanks. The picture isn’t mine. I usually credit the artist, but this is one I pulled off the web several years ago, and it doesn’t look like I put a link to the picture like I normally do. Most of my pictures come from The Commons on Flickr. You may check that out. For most of those you don’t need permission to repost, although some require a mention of the artist.